At Lion Sands Game Reserve 13,000ha is traversed, visitors will seldom see another vehicle as game drives are exclusive to Lion Sands (with the exception of a small tract of land shared with Kirkman’s Kamp). 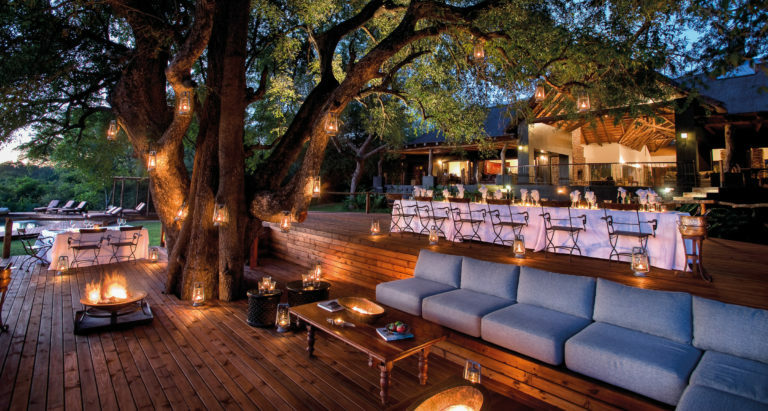 The only private game reserve with a foot in both the Sabi Sand Reserve and Kruger National Park, guests are treated to the most incredible wildlife viewing in the southern hemisphere. Four luxury lodges are each unique in respect of style and décor. Each flanks the Sabie River and enjoys spectacular views of both the bush, and the animals that flock to the water’s edge. Lion Sands has three luxury Treehouses where guests are able to spend a night under the stars in lavish style. Field Guides and Trackers are experts in their fields, and are the key to the success of the Lion Sands Safari. We are very proud to have one of the world’s only MASTER TRACKERS as part of our family at Lion Sands. In 2013 Lucas Mathonsi achieved the much coveted Master Tracker qualification, becoming one of four existing Master Trackers in the world, and only the second tracker to be awarded this prestigious qualification in the Lowveld since 1994! In line with the South African safari industry, at each of our Lodges visitors will enjoy two game drives per day, one early morning and one late afternoon. Each is approximately 3-4 hours long, and includes a scenic coffee and sundowner break to purely appreciate just being in the moment. What takes the MORE Safari Experience to the next level is the practical understanding and application of the four key ingredients for a first-class private safari experience. When it comes to those Guides and Trackers who we entrust to share the most important aspect of our Lodge experience, it is imperative to us that we get the selection right. We are very proud to have one of the world’s only MASTER TRACKERS as part of our family at Lion Sands. In 2013 Lucas Mathonsi achieved the much coveted Master Tracker qualification, becoming one of four existing Master Trackers in the world, and only the second tracker to be awarded this prestigious qualification in the Lowveld since 1994! The late Nick More (1967 – 2013) is the inspiration behind the NJ MORE Field Guide College, which embodies our wish to continue our long legacy of passionate, highly skilled and authentic natural ambassadors who believe in conservation, and take pleasure in sharing their passion with other people. Just like Nick. Madikwe and at Marataba, without trackers, in line with the nature of the environment. While each destination affords sightings of the Big 5 (lion, leopard, buffalo, rhino and elephant – the most dangerous animals to hunt on foot), they also present a unique and veritable collection of smaller animal species, bird species and vegetation. Comfort is King! At Lion Sands, never more than 6 people will participate on a safari (unless a party is larger, and requests their own vehicle). This means that everyone gets a window seat. In summer months, shaded canopies will be added to provide relief against the sun’s harsh rays and rainfall typical at this time of year. Each of the MORE properties enjoys a healthy size of traversing land. 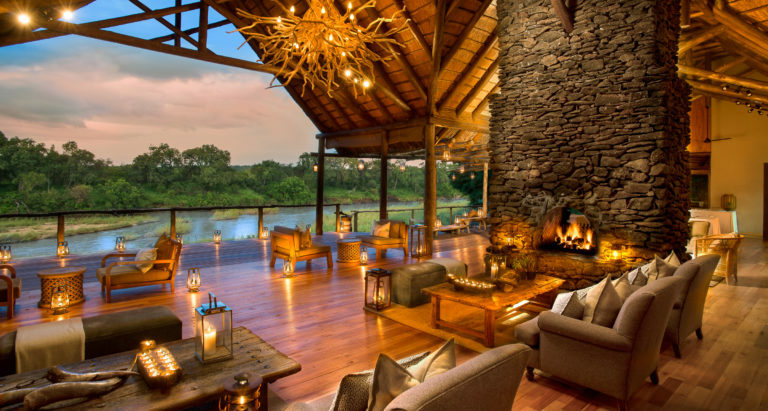 Narina Lodge находится в частной концессии Lion Sands Game Reserve в Национальном парке Kruger и располагается на вершине в окружении столетних деревьев, откуда открываются очень живописные виды на реку Sabi. Лодж построен на сваях и ненавязчиво сливается с прибрежными деревьями и рекой. Если вы хотите убежать от реальной жизни, Narina Lodge - это то место, куда вам следует отправиться. Этот лодж состоит из девяти просторных номеров, которые связаны с основным зданием деревянными мостками. Нежась в тёплой ванне, вы сможете любоваться африканскими пейзажами через панорамные окна, или расположившись на собственной террасе с бассейном. В интерьерах использовалось минимум цветов, и все они максимально природные, чтобы яркость внешнего мира не поблекла на фоне внутренней роскоши. Здесь все очень стильно и современно. Одно из самых приятных мест в отеле — это терраса с видом на реку. Она идеально подходит для времяпрепровождения утром, во время завтрака. 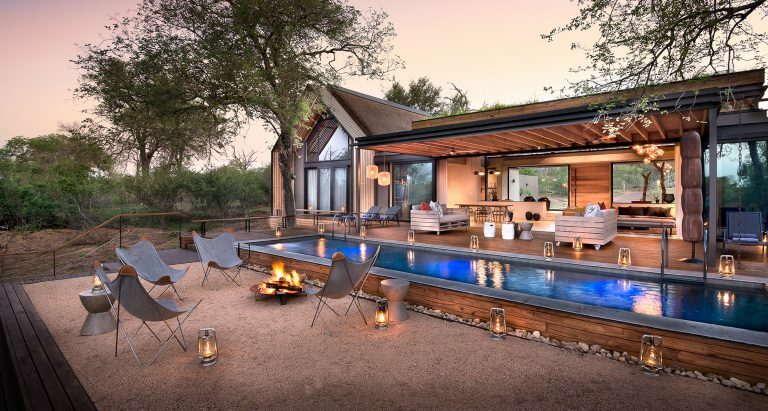 Lion Sands Ivory Lodge находится на территории частной концессии Sabi Sand Game Reserve в Национальном парке Крюгера. В отеле 9 частных вилл, каждая площадью 145 м², которые располагаются на приличном расстоянии друг от друга и соединены с общими зонами деревянными настилами. Каждая из вилл берет свое название от местной птицы. Не выходя из номера, вы можете любоваться красивыми закатами, слушать течение реки, наблюдать за слонами, зебрами, антилопами гну и даже крокодилами. И вокруг ни души.